Welcome to the Screenshot Showcase! The concept of this thread is simple: post a screenshot for feedback, and or give feedback to others. If you want to get some quick feedback on one or more screenshots, this is the place to do so. If you notice something that has been posted but hasn't received any feedback, please consider providing the poster with some form of feedback before you move onto later posts. Put some thought and effort into your feedback. While not all short feedback is bad, generally you want to make sure you're offering something worthwhile to the person requesting feedback. On a similar note, make sure what you're requesting feedback on has some substance to it. It doesn't have to be a lot of screenshots or a screenshot of anything groundbreaking, but perhaps mention a specific part of the screenshot that you want feedback on. Be respectful and civil. This thread isn't an excuse to be rude to another person or to tell them their screenshot is bad, be helpful instead. I really like that, NoodlesButt! I appreciate that you animated the reporter, and that the image being shown changes. That's a nice touch. Anyway, the grey pixels on the reporter's white outline don't look too good to me, but that's just a personal thing. The rest looks fab, though! I really like this interface. The animated reporter and backdrop behind him look amazing. I also like the mystery surrounding the interface. You've revealed a lot but not given any spoilers. I can't wait to see where you go with this! I think the tiles look great. I love the diagonal ones and the water. I think they look really good. The ladder and its shadow looks cool too. A few things, however. 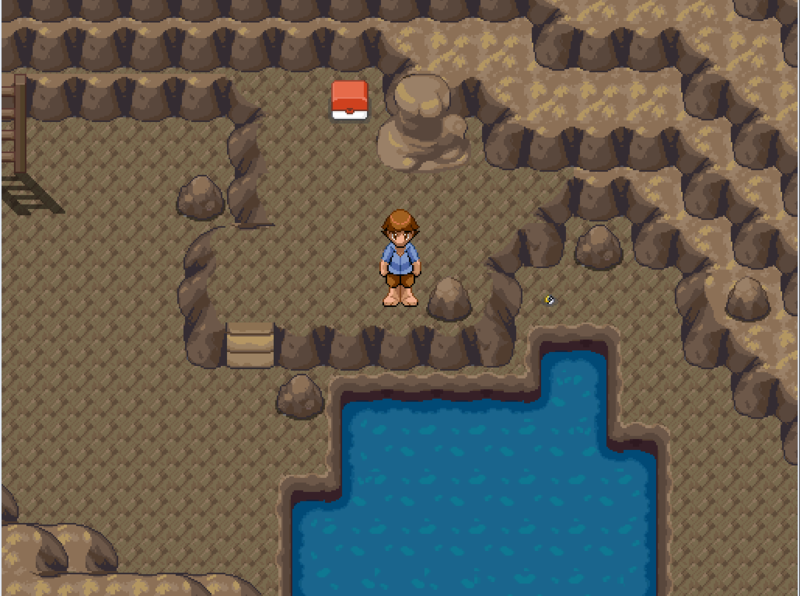 I feel like the large rock next to the Pokeball looks a bit strange because it has no outline. 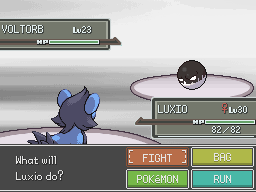 Also, the Pokeball look a little large for my liking compared to the sprite. They're just little things, but I thought I would comment on them too. Eevee: The most supportive of friends. Oh my... That is adorable. I really like that you have gone and added a portrait picture, it is something you don't see often in Pokemon/fan games. It really looks nice. There are probably a few ways you could experiment with that, try a border, maybe but out the body and have only the face (The mystery dungeon games should have some nice face portraits). But anyway, it looks ace. That's hilarious. I think it looks really cool. The sprites look really good, especially the Hatted Bronzong. I love the character portrait of the Eevee - it makes everything look clearer and easier to understand. I do think the colouring of the portrait contrasts with the tiles, which is not a critical issue, but still something that looks a bit inconsistent. That's the point of the portraits - to make it easier to understand who's talking. In the original, it was a bit of a clusterflip to know who was talking, since it was all just a bunch of long text blocks. Now, we have pictures. And yeah, the reason they contrast with the tiles is because the tiles have been washed out via Change Screen Color Tone since this is indeed a flashback. I could make the portraits a bit more washed out to match, but in all honesty, I don't think it really matters that much consider they're just a technical thing, and not actually in the scene itself. Have a quest history thing. It's a bit untidy but I'll deal with that in the future, the general layout should stay the same. Messages fade after fifteen-ish seconds. I'm a big fan of quest systems, personally, so I'm glad you've shown this. I agree with you about it being messy, and it kind of looks all over the place. I'm also not a big fan of the patterned rectangle at the bottom, it kind of distracts me from the actual text. 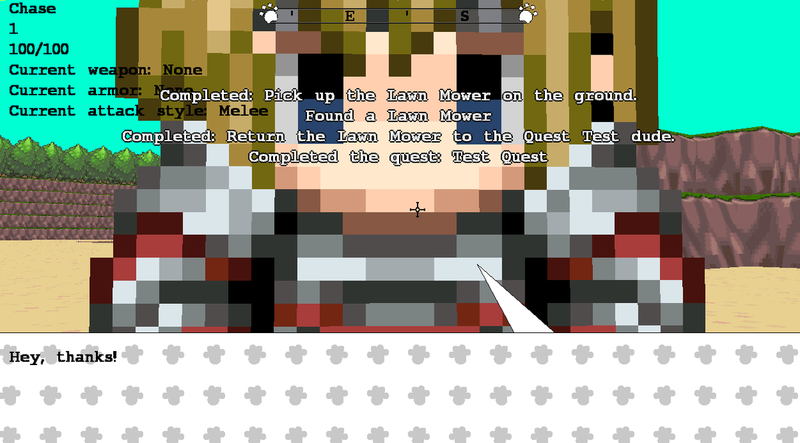 The quest writing is also a bit strange when I looked at it the first time. I think it's a bit hard to see with it being over the portrait. Other than those few things, I think it looks really good. I can't wait to see what you do with this interface. Showing off one of the Regional Variants. Slugma is Ground type until its HP drops below 50% where its hard outer shell will break giving it an added Fire type. This also changes its stats. I think this looks really cool. I love the creativity involved in the concept and I think it will engage players more when they discover a Slugma in the wild. At the moment, the sprite where Slugma is a fire type and a ground type looks kind of weird to me. I feel like the ground element sort of overtakes the fire, making it look a bit strange. Also, are you planning to use the original Slugma sprite? Just a question because it would be cool if you included both - kind of like Sun and Moon where non-regional trainers have the original Slugma form. Hey, that's a neat concept. Personally, I think that there's a little too many cracks on the pure Ground-type sprite and not enough magma on the Fire-type sprite. It could also benefit from a form change animation. Would you suggest more fire in the second form? The Slugma doesn't become completely fire, it just gains the fire typing. And yes, regular Slugmas are available at some point. A change animation will be done yeah! fwiw that's just the prompt that shows up the first time you register quest/stage, they don't stay there forever. here's the actual quest journal. Hahahah! It's looking a lot better now that I see the actual thing. I hope you go somewhere with this because I would really like to see something happening in the future with quest interfaces and Pokemon.